Pretty much all the fill needed has been brought onto the south side and the site contractor is finishing up rough grading the building pads on that side. The site contractor was able to save the lime rock base from the old parking lot to reuse under the new parking lots. On the north side of Central the first three buildings have been formed and rough plumbing is being installed. The contractor plans to pour those slabs late next week or early the following week, so there will be quite a few concrete trucks coming and going when that happens. They will likely stage the trucks on Central Avenue and use a pump truck to place the concrete. Storm drainage pipes and structures (concrete boxes buried at each inlet and bend in the pipe) are also ready to go in this week and next. One of the structures is on the northwest corner of the site, somewhat near the large live oak tree we are saving. On the advice of a certified arborist we had the roots pruned by a professional tree service in order to minimize the impacts to the tree. A couple people have asked about the drainage of the site, with the fill being brought in. The reason for the fill is to get the buildings above the flood elevation. The project site has been engineered and permitted with SWFWMD. 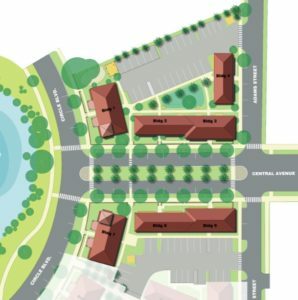 The site is graded to direct water that falls on site into an on-site retention pond and/or storm water inlets connected to the City’s storm water system. Water landing on the site, particularly the parking lot, is directed away from the abutting property. Looking ahead, once the slabs are poured the first three buildings will be ready for the concrete block of the first floors (the second and third floors will be wood frame.) Also, sanitary sewer lines will be installed and connected to the City sewer. This will involve some temporary lane closure on Adams Street where the sewer is located. We’ll share more details on that as we receive them.